What is the Successful Trans-generational Entrepreneurship Practice (STEP)? The Successful Trans-generational Entrepreneurship Practice(STEP) research project originates from an initiative launched at Babson College, USA. Babson College is world famous for its strengths in entrepreneurship education and research. Introducing the subject of family enterprising, Babson College and its Institute for Family Enterprising (under founding Director Timothy G Habbershon) wanted to draw a group of leading business schools and entrepreneurship and family business scholars together to investigate transgenerational entrepreneurship in family business. STEP is intended to be a global research project, and the first region to start conducting research was Europe. Since July 2005, a group of six leading European business schools have conducted case research based on a common research framework and methodology. 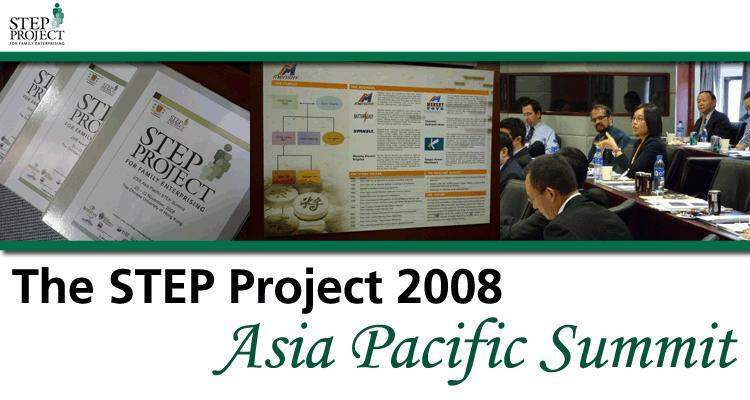 The STEP project was launched in ASIA PACIFIC in 2007 using the successful modelled developed by the Europeans and which was subsequently adopted in South America. This edited volume reports and elaborates the findings of the STEP Asia Pacific Consortium after their first family summit in 2008. The STEP Project, acronym for Successful Transgenerational Entrepreneurship Practices, is an international research study on corporate entrepreneurship in family businesses initiated by the Babson College. Following a rigorous research scheme, scholars from India, Greater China, and Australia conducted in-depth case studies and wrote up 11 chapters addressing the challenges that business families face in sustaining successfully their entrepreneurial capabilities across many generations. These challenges include dealing with communication issues across generations, resolving conflict between siblings, preparing and luring younger generations back to family business, and professionalisation of business. The chapters go beyond the succession and governance challenges and explore the processes and outcomes of entrepreneurship in the Asia family context. Hosted by the Chinese University of Hong Kong (CUHK), the first Asia Pacific Successful Trans-generational Entrepreneurship Practice (STEP) Summit has been successfully held on 20-22 November 2008. With more than 160 participants from family businesses and educational institutions of different regions, the summit underwent extensive discussion on entrepreneurial family firms in Asia Pacific rim. The family case studies of Battaglia Family and Deague Family from Australia and Lee Kum Kee Health Products Group Limited of China in the afternoon session marked the climax of the Summit. Both family business executives and scholars benefited from the summit through mutual exchange of ideas. The intention of this book volume is to report and elaborate the ASIA PACIFIC findings from this case research. Each ASIA PACIFC university team will contribute with one chapter based on their case research that investigates a particular, or multiple dimensions, of the overall research framework. These chapters will be scholarly and research-based chapters (that is, not teaching cases). The purpose of each chapter will be to interpret the common research question to introduce key findings to extend or challenge existing theory. The authors of each chapter will be asked to follow a specific chapter template in order to secure a consistent and well-structured edited research volume. We will also have an internal review process among the contributors to support the writing process and ensure final quality of the chapters. How do business families and family businesses generate and sustain entrepreneurial performance across generations? How does entrepreneurial performance relate to continuity, growth and transgenerational entrepreneurship of business families and family businesses?